The Federation of Islamic Associations of New Zealand (FIANZ) is the umbrella organisation for Muslim organisations around New Zealand, including men's, women's and youth organisations. The Islamic Women's Council of New Zealand (IWCNZ) is a group that was formed to cater specifically for the needs of Muslim women around the country. 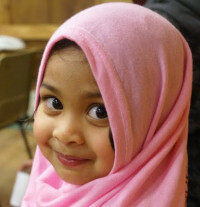 Formed in 1991, IWCNZ recognises all Muslim women in New Zealand as its members. Each regional woman's group nominates representatives annually to serve on the IWCNZ Executive Committee. As an affiliate of FIANZ, IWCNZ provides representation for Muslim women and girls' youth in FIANZ's general Council meetings and is committed to working with all groups to enhance unity amongst the Muslim Ummah in New Zealand. IWCNZ regional representatives and executive coordinators meet regularly in teleconferences throughout the year to discuss current nationwide projects as well as keep communication lines open between the regions and their various local activities. In this way, Muslim women around the country can remain in touch with one another and access helpful people and resources. On a regional level, IWCNZ members autonomously run a large variety of programmes and events to cater for their own unique communities. These activities include women's educational classes; helping women get counselling and other forms of help, convert care, and many more activities from Qur'an and netball competitions to food banks and prison visits. IWCNZ's national activities include an annual national conference open to all, located in one of the regional venues: Auckland, Hamilton, Palmerston North, Wellington or Christchurch, on a rotational basis. Other regions that have active IWCNZ women's groups are Rotorua, Hastings and Dunedin. Other IWCNZ national activities include girls' youth camps and sporting events; and ‘road show' workshops catering for special areas of need for women, such as empowering women and children to feel safe, children's Islamic education, and so on. IWCNZ reaches out to the wider New Zealand community through liaising with various government groups like the New Zealand Police and the Ministry of Ethnic Affairs. Members of IWCNZ respond to the media when required. IWCNZ is represented in a number of countrywide initiatives and forums on such topics as Interfaith, Human Rights, youth development, and palliative care and so on. IWCNZ participates in a small number of international forums and is a member of the Regional Islamic Da'wah Council of South East Asia and the Pacific (RISEAP). 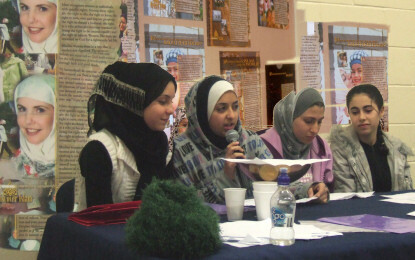 IWCNZ supports Muslim women's empowerment by encouraging women to gain the skills and knowledge, spiritually, socially and economically that will enable them to overcome obstacles in daily life, work, and other environments that ultimately assist them to develop within themselves and within society. The benefits of an empowered Muslim woman can strengthen her family; maintain and preserve Islamic faith values both within the home and outside of the home which in turn contributes to building a strong family unit, a vibrant community and a healthy society. Founding members include Sisters Nasreen Hannif, Aunty Ayesha Sharif, Aunty Qamar Rahman, Rehanna Ali, Anjum Rahman, Leila Adam, Aliah Holewood and others. 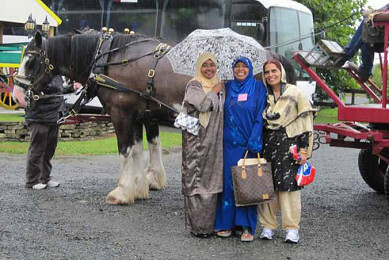 Sisters at the 2011 IWCNZ Conference about to take a horse drawn carriage ride. Muslim women aspiring to achieve their full potential through participation and collaboration in community life in Aotearoa New Zealand with the guidance of the Qur'an and the Sunnah of Prophet Mohammad (peace be upon him). To always endeavor to co-ordinate and develop various activities that provide help, guidance, personal growth and development for all sisters in Islam - with inspiration from the Holy Qur'an and the Sunnah of Prophet Mohammad (peace be upon him). 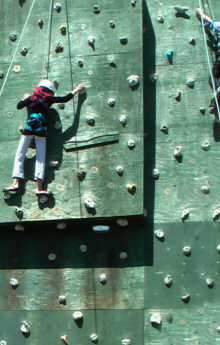 Rock climbing at the Blue Sky camp. To organize conferences and symposiums at a national level, including the IWCNZ annual conference. To incorporate the promotion of Islam through activities such as Women's Conferences, Youth Camps, Educational Programmers, Islamic Quizzes, Qur'an Reading Competitions, etc at local and national levels. To promote the holistic wellness of Aotearoa New Zealand Muslimah that incorporates health, spirituality, physical, occupational, environmental, emotional, intellectual, cultural, and social well-being. To support Muslim women in identifying issues and providing information and resources relating to its members needs. To co-ordinate and develop various sporting activities for Muslim women of all age groups at local and national levels. To liaise with women's groups on a national and international level to advance and lobby for its members. To circulate information relating to the needs of its members at a local level when and where appropriate. To present to the FIANZ Council the views and needs of its members. To work to enhance unity amongst all sectors of the Muslim community in NZ. To represent Muslim women from all ethnic, cultural and age diversity groups at a local and national level. IWCNZ will be guided by the Qur'an and Sunnah of the Prophet Mohammad (peace be upon him) as the last prophet and the messenger of Allah, and the traditions of the companions of the Prophet Mohammad (peace be upon him), beginning with the four rightly guided Khulafa. IWCNZ aims, objectives and activities will embrace Islam as a complete way of life. IWCNZ will seek to serve the best interests of Islam and Muslims in New Zealand. To promote their spiritual values through understanding, acceptance, education, interaction, respect, and cultural awareness - paving a pathway to a safe and respectful environment. IWCNZ shall seek to avoid any practices that are contrary to Islam and thus will endeavor to promote a platform of unity, peace, love, respect, humanity, and kinship. Group is officially registered and approved by IWCNZ. Group vision and mission statement are in accordance with IWCNZ. Guided by the Qur'an and Sunnah of the Prophet Mohammed (peace be upon him). Objectives and activities of the group embrace Islam as a complete way of life. Groups can apply for an affiliate status to IWCNZ at any time. All Muslim women will automatically become members of the Council unless they choose to opt out. For further information about Islamic Women's Council of New Zealand and their activities please email the Secretary at iwcnz@gmail.co.nz. If you would like to stay updated with current information about our activities, join the IWCNZ Yahoo Group please email us. This page last updated 9/07/2015 5:22:17 p.m.